The long-awaited 11-mile section of U.S. 219 from Somerset to Meyersdale finally opened to traffic in November. This project has been in development since the 1970s, but the project was put on hold due to available funding. Design work took place in the 2000s but, again, construction was delayed. 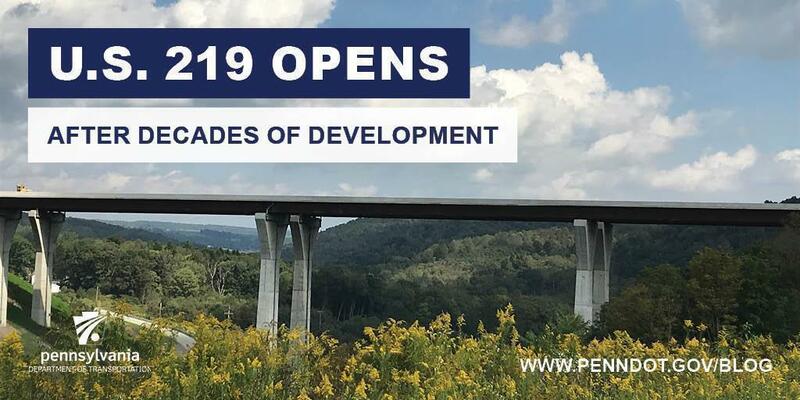 In 2012, the passage of the federal transportation bill made projects in the Appalachian Development Highway System eligible for 100 percent federal funding. This made the 219 project a reality. Ground was broken on the project in 2013 and construction was completed five years later, on schedule. The new section of four-lane limited-access highway will provide motorists with a safer, more modern facility. It also will help promote economic development in the communities along this corridor. This project ultimately was made possible through the hard work of many community members, local leaders, and elected officials and this effort was recognized by PennDOT Secretary Leslie S. Richards at the ribbon-cutting event held Nov. 21. "We are excited to be here today to open this new and much-needed piece of highway," she said. "The passion surrounding this project from the community members to local leaders and elected officials has been outstanding and has helped bring this long-awaited project to fruition."